A heart-felt THANK YOU to the Trainers who have taken the time from their busy schedules to share their experience with Principe Silver. Here they are, in the order they posted. Scroll down to see what they say! Over the years I have collected over a half-dozen of Frank’s bits. Nothing else compares to the feel and balance of them. I have only to pick up the reins on a western horse to know if it is a Principe bit in the horse’s mouth. I am a client at Setting Sun Stables with trainer Joe Reser who has so many of your bits I can not count them all and when it was time for me to get my own bit for 6 time National Champion ” Jo Money ” I turned to the bit maker that got him to those National Championships Mr. Frank Principe ! Joe made two laps on Mr. Flash aka Jo Money this past weekend and said ” I love this bit ” ! Thank you for making another masterpiece of a bit for my boy ! It was a great day many years ago when I was introduced to Frank Principe and his bits. From working snaffles to show bits, his workmanship is unparalleled and his knowledge behind his bits is very hard to find. You can talk to Frank on a professional level and he understands how a horse feels and responds to a bit. It is wonderful to have someone that can actually make what you need. He has literally made me a bit for all my versatile Arabians. English, Show hack, hunter and of course his western snaffles and beautiful silver show curbs. Frank has been my friend for many years. I have ridden and shown horses in his bits and found them superior in quality, craftsmanship, and my horses love them. It is important to me to have bits that are handmade, verses the cheap overseas copies that are sold extensively today. Frank’s bits will last for a lifetime and will be worth something if you ever want to sell them later. But for me…..mine are not for sale!!! 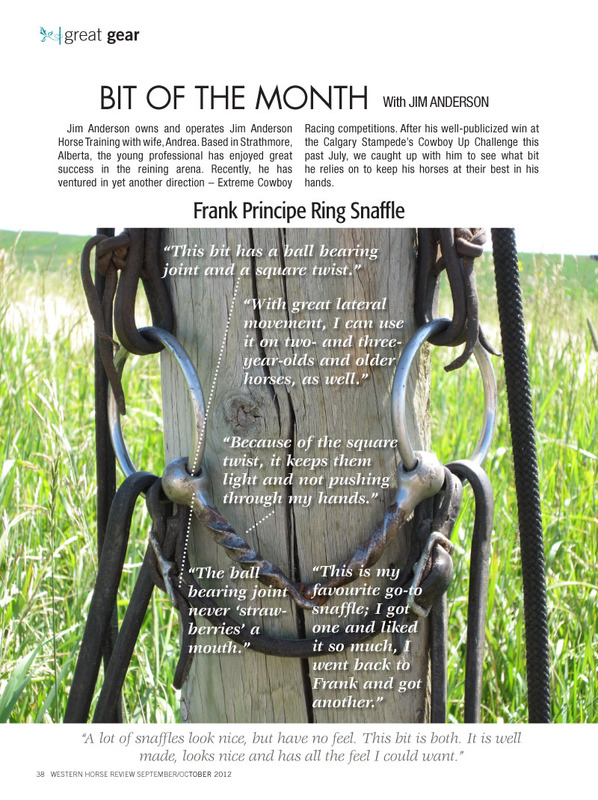 Thanks Frank for being a friend, horseman, and outstanding bit craftsman. It’s great working with Frank because I’ve been using Frank’s bits for years. And when you can get a bit customized for a particular horse it’s even better. One of Frank’s current creations is the only thing we ride STLA C Im Fonda U with and after struggling with other bits of other makers using Frank’s bits, we’ve been able to achieve big prizes. Frank has been a personal family friend for many years. I have several of his hand made bits and spurs which I have shown in over the years. They are keepers, well designed, and handcrafted. I love them. Many of my students when they decide to make the move to custom bits and spurs I always refer them to Frank.